Security » Aeris Enterprises Inc.
Aempower Security provides the foundation for all Aempower Suite® components. Layered between the legacy ERP system and the Aempower components, Aempower Security provides single sign-on authentication, access control services, and automates a number of user security updates. At the core of Aempower Security is an enterprise-wide directory, serving as a central repository that stores the “master list” of employees. 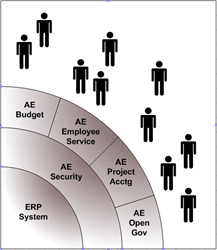 All employee-based processing – across all Aempower components and the existing ERP system – is driven from this directory. This simplifies and streamlines employee processing and maintenance. Another feature of the directory is its use of Lightweight Directory Access Protocol (LDAP). The open LDAP standard provides a choice of directory vendors and ensures that the directory can be easily integrated with other enterprise applications. Combined with a central, web-based administrative interface, Aempower Security not only controls system accessibility for a user, but its flexible role and domain assignment functions can be used in implementing sophisticated user security policies in the most complex organizational structures.